You’re baby steps from the best preschool teacher resume on Earth. You could make more money doing something else. But then you’d miss all that laughter, play, and love. You wouldn’t mean something to those blooming lives. But they don’t pass out preschool teacher jobs like crackers and apple slices. Your preschool resume needs to stand out like Maria Montessori at a tiny table. Preschool teacher resume examples better than 9 out of 10 others. How to write a preschool resume that gets more interviews. Tips and examples of how to put skills and achievements on an early childhood education resume. How to describe your experience on a resume for a preschool teacher to get any job you want. Here's a preschool teacher resume template made with our online resume builder tool. What's the Best Format for a Preschool Teacher Resume? Does preschool teacher resume format matter? She’s got 75 preschool resumes to read. You’ve got to show your talents fast. The reverse-chronological resume format does that. It puts your most recent accomplishments at the front of the line. Keep it eye-friendly with strategic white space and big headings. 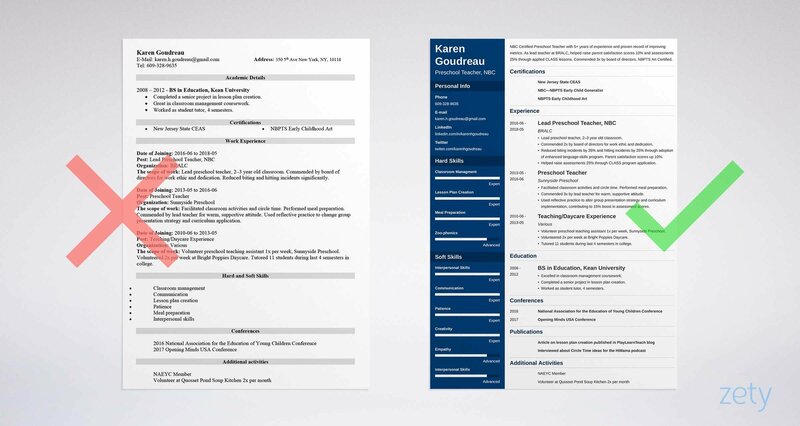 Use the best resume fonts so Sharon doesn’t have to squint. Finally, save your preschool teacher resume as a PDF. Today’s PDFs are machine-readable so they play well with hiring software. Plus they won’t throw a tantrum in transit. But make sure the job offer doesn’t rule them out. Pro Tip: Switching into preschool teaching from some other job? Consider the combination resume format. It pulls in relevant highlights from your work experience. Your preschool resume must make the director say that in the first six seconds. If not, she’ll skim your early childhood education resume. So, make her pay attention like a great student during circle time. Do it with a preschool teacher resume objective or resume summary. Got enough experience to finish Anna and Elsa’s sandwiches? Use a resume summary. It wows the director with your experience. Haven’t said “gentle hands” more than 20 or so times yet? Use a resume objective. It can sell your passion. The real trick? Stuff both with measurable achievements. These two preschool teacher resume examples paint the picture. Hard-working preschool teacher with 6 years of experience. Responsible for performing preschool teaching tasks at Little Inspiration Preschool, including leading circle time, assisting with curriculum creation, guiding student interaction, diapering, and meal prep. Skilled in communication, patience, creativity, and empathy. That’s not exactly running with scissors, but it won’t start a stampede of interviews. Why? It says you did things, but not how well. NBC Certified Lead Preschool Teacher with 5+ years of experience and proven record of improving assessment scores. As lead teacher at BRALC, helped raise parent satisfaction scores 10% and assessments 25% through applied CLASS lessons. Commended 3x by board of directors. NBPTS Art Certified. Skilled in communication, patience, creativity, and empathy. Wow. This is obviously not your first time growing sunflowers. Those measurable achievements make it work. Can’t point to accomplishments like that? See our next two preschool teacher assistant resume examples. Is your preschool teacher experience is more like a blank lesson plan? Use a teacher resume objective. Passionate preschool teacher, skilled in communication, patience, empathy, and problem solving. Physically fit and trained in lesson plan creation and Zoo-phonics. No on-the-job experience yet, but I’m eager to learn! Wow, he really cares. Unfortunately, so do lots of people with more experience. Passionate preschool teacher with volunteer preschool teaching experience and daycare experience. Worked as student tutor in college and completed a senior project in lesson plan creation. Commended by professors for strong work ethic and warm personality. Skilled in patience, communication, and classroom management. That’ll make the director drop her copy of Powerful Interactions. Pro Tip: Don’t write your preschool teaching resume objective or summary first. Create it from the highlights of your finished resume. It’s easier that way. Let's get back to our center director, Sharon. Two big blunders in preschool resumes will make her need the peace and quiet corner. The first is more clutter than a 10-foot toy box. The second? Not enough experience to fill a tiny teacup. Solve both problems by focusing on her needs. If you’ve got so much experience your blood tests positive for fingerpaint, list your last job first. Put your best achievements in 3-5 resume bullet points. Make sure they match the job offer. See the lead preschool teacher resume examples below. Lead preschool teacher, 2–3 year old classroom. Commended 2x by board of directors for work ethic and dedication. Reduced biting incidents 35% and hitting incidents 25% through adoption of enhanced language-skills program. Parent satisfaction scores up 10%. Helped raise assessments 25% through CLASS program application. The hiring manager would have to be eating paste to skip that. Your resume for preschool jobs just sold her. Facilitated circle time and helped with meal prep. Worked to adopt enhanced language-skills program. Responsible for discipline and diapering. That’s the bowl haircut of the preschool teacher resume world. But what if you’re writing a new teacher resume with no experience? See these next two entry-level preschool teacher resume examples for a lesson. Why would a director hire you with no experience? Maybe it’s not in teaching preschool. But it can still be relevant. What stands out in these two preschool teacher assistant resume examples? Preschool Teacher Experience: No on-the-job experience as a preschool teacher yet, but I’m very dedicated. Goodnight, moon. That candidate might get hired to clean the whiteboards. Facilitated classroom activities and circle time. Performed meal preparation. Commended 3x by lead teacher for warm, supportive attitude. Used reflective practice to alter group presentation strategy and curriculum implementation, contributing to 15% boost in assessment scores. Pro Tip: Coming up blank for teaching experience for a preschool resume or daycare teacher resume? Even working with pre-K kids as a ski instructor or leading trainings in a retail job can transfer. Your education matters to the center director. But just listing it is lazy. To connect with the director, add bullet points that matter to her. Then add achievements that match the job description. Both these preschool teacher resume samples are for a job that values classroom management and lesson plan creation. Excelled in classroom management coursework. Completed a senior project in lesson plan creation. Worked as student tutor, 4 semesters. Pro Tip: Should you list GPA on a resume for preschool teachers? Only if it’s impressive or recent. If not, use the space for something that will wow the director. If you’ve got the right skills, what else matters? Saying you’ve got skills and proving it are as different as cupcakes and brussels sprouts. To convince the director, pay close attention to the job description. Highlight the responsibilities and skills it lists. Then, fit your preschool resume bullet points to it like an Astronaut in Training romper. The next two preschool teacher resume examples show how. Don't just say you've got those skills. Wow. That candidate used listening ears! Do that, and preschool hiring managers will raise their hands to get your attention. Need some preschool teacher resume skills to start? Use the ones below. Add to them from preschool teaching offers in job websites. The list makes great resume keywords too. Take the steps above, and your resume for preschool jobs will make you stand out like the Paw Patrol. Pro Tip: The skills above are just a short list. Maybe you’re skilled in reflective practice, Teaching Strategies Gold, or newsletter writing? If the job description lists it and you’ve got it, put it in your preschool resume. Where should you show preschool teacher licenses and certifications? Near your name? In your resume objective? In a special certifications section? In your job descriptions? Showing you’re certified in many places isn’t overkill. It helps the director see you’re qualified, no matter where she glances first. Put your main certification everywhere it fits. Add others to a special certifications section. Don’t show every certification on a resume for teacher jobs. Only show the ones that fit the job description. Pro Tip: Do you know your state’s licensing requirements for preschool teachers? 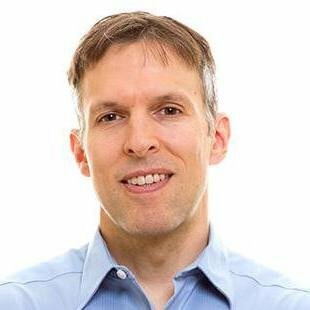 PreschoolTeacher.org maintains a great list of state and setting requirements. Imagine that you have a superpower. You can bring the center director six months into the future. You can show her what a great employee you’ve become. But you can do the next best thing—by showing her you’re great to work with. Do that with special resume sections in a resume for preschool teacher jobs. See that work in two sample preschool teacher resume clips. On a resume for a preschool teacher, everything should speak to your teaching chops. Wow. It’s moving-up-day for that applicant. That preschool teacher resume makes the others look like dirty diapers. Even the CrossFit helps, since preschool teachers need to stay in shape. Pro Tip: Did you get high Praxis test scores? Those look great on a resume for preschool teacher jobs. Don’t say, “references available on request” since that’s understood. What About a Preschool Teacher Cover Letter? Who needs to send a cover letter with a preschool teacher resume? You, if you want the job. But don’t send a plain vanilla preschool teacher cover letter. You know, the one that says, “Here is my resume,” in your best robot voice. Stand out like a PJ Masks onesie instead, with a customized cover letter. Start with the hiring manager’s name. Then show you know her needs. Next, prove you can meet them. I read Small Wonders Preschool’s mission statement online, and I love your focus on teaching to each student’s current interests. Even better, conversations with your current teachers show it’s not just words on paper—you really live by it! I'd welcome the opportunity to talk about furthering your mission for child-directed learning. Pro Tip: Follow up on your assistant preschool teacher resume cover letter. If you don’t, you may fall through the cracks even if the director likes you. Don’t make this entry-level blunder on your preschool teacher resume. But also, add a LinkedIn address to a resume for preschool teacher jobs. These days, 87% of employers use LinkedIn when hiring. Not sure how to do it right? Use our LinkedIn profile guide. Pro Tip: Should you put your mailing address on a preschool resume? It’s not required, but if you live close by, your address can show you’ll have a short commute. Here’s a quick recap of how to write a preschool teacher resume that shows your mini-human superpowers. Write a preschool resume objective. In it, put your best 2–3 accomplishments that fit the job. Read the job description carefully. Match it to your bullet points like memory-game cards. Add other sections that show you’re great to work with. Include volunteer work, publications, interests, and conventions. Write a preschool teacher resume cover letter. In it, tell the director why you want the job, and why you’re a perfect fit. Do you have questions on how to write a resume for a preschool teacher? Not sure how to describe your pre-K skills or achievements? Give us a shout in the comments! Let's get you hired fast!